By encouraging EU Member States to ratify the ICMW, Commissioner Avramopoulos would not be doing anything new. 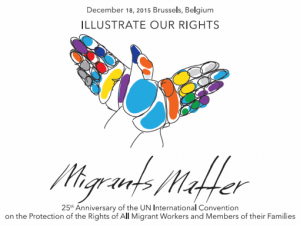 In 1994 the European Commission urged EU Member States to ratify the Convention so as to ensure that migrants’ rights in the EU correspond to the highest international norms and to highlight the value attached by the EU to improving the situation of migrant workers and their families. What better time for the European Commission to renew its call for ratification than the 25th anniversary of this core international human rights instrument? We are sending postcards to Commissioner Avramopoulos for a number of reasons. Sending postcards allows the sender to have a sense of active participation and ownership in the campaign for ratification. It gives a voice to the individual. It makes more tangible what can sometimes seem like an abstract international document. Sending a high volume of postcards will provide evidence of the fact that support for ratification is widespread across the EU. The postcard campaign will also serve to raise awareness of the Convention amongst the wider public. The postcard campaign will ultimately gain further support for ratification of the Convention amongst all Europeans who are concerned about human rights and who want to see the EU provide migrants with the minimum standards of human rights protection that the international community has agreed to confer on them in the form of the ICMW.